Well, what an exciting end that was, but ultimately it's Lancashire who go through to Finals Day. Commiserations to Kent who did so well to take the game down to the last ball. I'm afraid that's all we've got time for today. But don't forget, we'll be back in exactly two weeks to bring you live text and radio commentary of Finals Day. "It was a toss of the coin off the last ball. One of the ones you enjoy on the winning side but tough to take on the other side. "I wasn't sure whether to watch or not, we just got over the line but that's all you've got to do. "When you get out in that situation you really feel like you should get over the line, but that's the game in Twenty20." "It was just one of those things and we fell on the unlucky side of it. "We were a little bit short and James Tredwell played well just to get us up there. "Our death bowling has been brilliant all year, but we just didn't get enough runs." "We've been in that situation a few times but today just scraped through. "Hats off to them (Ashwell Prince and Jos Buttler) they played two gems of innings. "The pitch was a bit tricky but those two set the game up brilliantly for us." Well that was quick and easy but now we know how the semi-finals shape up on 29 August. Northants will play reigning champions Birmingham Bears. Hampshire take on today's winners Lancashire Lightning. The order in which these games will take place is yet to be confirmed. So after that thrilling finish at Canterbury, we now know our four teams who go through to Finals Day at Edgbaston on 29 August. Joining Lancashire will be Birmingham Bears, Northants and Hampshire. The draw for the semi-finals will be taking place shortly, so stay tuned. "What a finish to a game. "You really have to feel for Kent on their home ground after they wrestled themselves back in to the game." The scores are level, but Lancashire go through to Finals Day having lost fewer wickets than Kent. What a final over! James Faulkner smashes Matt Coles' final ball down the ground, it hits the stumps and deflects down towards the boundary, but Faulkner and Arron Lilley have the time to scamper two. Kent kept themselves in the game right until the death, but they just couldn't get over the winning line. James Faulkner swats Matt Coles away for two to mid-wicket. Three needed off the final ball. How did it come to this?! Dot ball! Five needed from two. "Lancashire have done all the hard work and now there's a late twist. "The crowd sense the upset!" Unbelievable drama! Steven Croft gives his wicket away by slicing Matt Coles to Fabian Cowdrey on the cover boundary. The Lancashire captain is absolutely livid. Five needed from three balls. "It's the slower ball that's done for Jos Buttler. He tried to win it with a six and Alex Blake holds his nerve on the boundary. "Kent have got a little window to get themselves to Edgbaston." Kent are still in this! Jos Buttler tries to end the game with a six, but can only sky the ball to Alex Blake on the long-on boundary. Five needed from four balls. It's tense at Canterbury. "You want your big man to stand up at moments like this and it's exactly what Jos Buttler has done there." That is superb from Jos Buttler. He releases all the pressure with another reverse sweep for four off Mitch Claydon to also bring up his 50. It comes off 36 balls, with five fours and three sixes. Lancashire need six off the final over. "Much needed wicket there and the class of Ashwell Prince, the way he was going, he has just gifted it away. "Kent will just sense that they can get a sniff here if they can keep the new batsman on strike." Ashwell Prince has been faultless on the leg side all afternoon but not this time. He smashes a Mitch Claydon full toss straight to Joe Denly on the square-leg boundary. Is there still hope for Kent? You'd have to say not with Jos Buttler still at the crease. Captain Steven Croft is the new man. Jos Buttler rubs salt into Kent wounds by hitting Ivan Thomas for three fours in four balls, the second of which is a magnificent reverse sweep. The target is down to 13 off two overs. Lancashire are home and hosed. "Ivan Thomas is devastated. Absolutely livid. "He genuinely believes he has got a hand on that and as a bowler, you just know in those situations when you've touched it." A little bit of controversy here as Jos Buttler smashes the ball back to the bowler and Ivan Thomas appears to get a little touch on it which deflects into the stumps. Ashwell Prince is out of his crease but given not out. There was no clear evidence Thomas got a finger on the ball. "Kent just need to find a little miracle here, a bit of magic. "But, you just feel it might not be happening for them today." Mitch Claydon concedes just seven runs from the 17th over. Exactly what Kent needed at this stage. Lancashire are still strolling to victory, but they won't want to leave it until the last over. I'd expect some more Jos Buttler fireworks pretty soon. "That's easily one of the biggest sixes I've ever seen struck here on this ground. "A man has rather impressively put down his pint and caught that before throwing it back on the field." That is a tremendous strike from Jos Buttler. Buttler clears his front leg out of the way and smashes James Tredwell back over his head for a huge straight six. The England man is onto 35 in no time at all. Lancashire Lightning need 33 from 24 balls. That's a better over from Darren Stevens for Kent, but Lancashire are still walking this. The 39-year-old offers no width and Lancashire can only get him away for five singles. The visitors need just 41 from 30 balls. A piece of cake, surely? "Class shots from a class batsman there from Jos Buttler. "This game is quickly running away from Kent." Kent simply can't stop the boundaries coming. Jos Buttler chops Ivan Thomas away for four, before ending the over with a big six over cover. Beautiful piece of timing from the England man. "Ashwell Prince helping to anchor the innings here for Lancashire. "His fourth 50 of the competition this year so far and he's doing it when it matters the most." The South African brings up his fifty with another lovely piece of timing to the mid-wicket boundary. It means Fabian Cowdrey's over goes for 10. Not what Kent needed. "Jos Buttler's away here. He's got a start and Kent will be concerned about that. "He's ticking early in his innings." James Tredwell uses all his experience in that over, mixing up his pace to keep it to just four runs. Ashwell Prince is just four runs away from a half-century. He's hardly played a shot in anger. That's the class of the man! Ashwell Prince is unfazed by the wickets falling at the other end as he clips Darren Stevens for his fourth boundary. This target shouldn't cause Lancashire too many problems, but another wicket could make things interesting. "That shows the character of a big player there. Jos Buttler has come in, got in a bit of trouble first ball against Tredwell, but then responds with a huge hit over the ropes. "That's how you handle the pressure of the occasion." Jos Buttler announces his arrival at the crease by launching James Tredwell over mid-wicket for a max.. Earlier in the over, Buttler was rapped on the pads, but the ball was turning down leg side. Lancashire need 79 from 60 balls. With Buttler here, it could be over in half that time! "Kent needed a little bit of a breakthrough, a bit of impetus. "A crazy shot from Liam Livingstone there has just given them a bit of hope." James Tredwell removes Liam Livingstone leg-before as the batsmen attempts to sweep him away, but the ball appears to strike him outside off stump. Livingstone can consider himself a little unlucky there. Jos Buttler is the new man. "It's the batsmen that have got Kent in to this position, making it very hard for them to defend this target. "Kent need wickets, they need them desperately and quickly." Darren Stevens is so difficult to get away. He's not the quickest but bowls a nagging line and length which makes scoring off him tough. "As soon as that ball left the bat, the fielder at deep mid-wicket probably said, 'I'll go'. "It was six as soon as he connected with it." James Tredwell ruins an accurate over by bowling a long-hop which Liam Livingstone dispatches over mid-wicket for six. Just what Lancashire needed after a slow few overs. "The crowd have burst into life as fans' favourite Darren Stevens returns to the boundary edge after taking a wicket. "A few jumpers are being pulled on as the wind picks up and the supporters' nerves grow." Lancashire are suddenly struggling to get the ball away to the boundary and the run-rate is starting to climb. Fabian Cowdrey bowls another tight over, conceding seven runs. The visitors need 99 runs from 78 balls. "Good battle this between Stevens and Prince. He's a wily old fox Darren Stevens and he's doing a good job for his skipper. "It's about even after the Powerplay overs and Kent will feel they're still right in this." Darren Stevens does what Darren Stevens has been doing for the best part of 15 years and keeps things really tight. He concedes just five runs from his first over and picks up the big wicket of Karl Brown. Ashwell Prince is still looking dangerous though. "That's a real old-fashioned 'you miss, I hit'. "Darren Stevens points his finger in the air as if to say, 'easy young'un, I've still got plenty of cricket left in me'." Darren Stevens has done the job for Kent once again. Karl Brown plays a horrible swipe across the line and the ball clatters into his stumps. Kent are right in this, but you feel they'll have to get Ashwell Prince out soon. "What's clear is how good Ashwell Prince is at anything off his legs. If you bowl too straight to him, he just gets himself nicely in line to get it away. "Maybe you have to bowl a bit wider of off stump to him." Ashwell Prince is eyeing up the short leg side boundary time after time. He plays another clip for four off Matt Coles and looks in great touch. Saying that, when dose he ever look out of nick? Not too bad from Coles apart from that boundary though as he concedes just six from it. A much better over for Lancashire helped by a six and four from Ashwell Prince off Mitch Claydon. "That release of pressure has come and it's all Ashwell Prince for Lancashire responding to the situation." That is a spectacular pick up from Ashwell Prince. The South African swats a length ball from Mitch Claydon over the mid-wicket boundary for a max. Matt Coles finishes off a fine over with three dot balls to the new man Karl Brown. Big, big wicket for Kent, but from a spectators point of view it looked very comical from Alex Davies. "He tried to go for the ramp shot and has fallen over while doing so. "He's plumb in front lbw and I don't think I've ever seen a dismissal like it in my life!" Erm, you don't see that every day! Alex Davies steps across his stumps and tries to scoop Matt Coles over the wicketkeeper's head. But he completely misses the ball, falls over and the ball strikes his pad right in front of middle stump. Plumb as they come and a rather sheepish looking Davies is on his way. "We didn't see any medium pace during the Kent innings, so it will be interesting to see if this wicket is to Darren Stevens' liking if he comes on to bowl. "If it is, it could be game on." That's a fine first over from Mitch Claydon. The Kent seamer finds a nice line and length and concedes just one one from it. Just what the hosts needed. "That's a decent start for Lancashire. Ahead of the rate already and it will have settled the nerves. "Lancashire should win this, but it's not going to be quite as easy as you might think." Matt Coles starts off by bowling a wide down the leg side, before keeping things tight for a few balls. But Ashwell Prince oozes class and plays a short arm jab for four through the vacant mid-wicket area. Eight off the first over. The Lancashire openers, Ashwell Prince and Alex Davies are strolling to the middle. They have just 143 to chase, but Kent will definitely feel boosted by that eighth-wicket half-century stand. Matt Coles will open the bowling for Kent. The Australia women's team are in town after their Ashes Test win yesterday. "That partnership between Cowdrey and Tredwell got them to a position where you just thought Kent could be competitive, but they've made some poor decisions there in the final over. "We've seen 140 defended in games before, but the key is their bowlers are going to have to be disciplined against a stacked Lancashire batting line-up." And that will be that! James Faulkner keeps it straight and full and it's enough to beat Ivan Thomas. Kent are all out for 142, but it's a pretty good recovery from 86-7. "This final over has not been too successful. Just five runs off the first five deliveries and Tredwell has faced just one of them." Mitch Claydon gets an edge for four off James Faulkner, but the Australian follows it up by bowling another straight one which clatters into his stumps. Good final over from the Aussie quick so far. "Good knock from Cowdrey. A good partnership between this pair, which might just give them a chance." Kent have to take every run available in this final over, but it's led to the dismissal of Fabian Cowdrey. Cowdrey tries to sneak a quick single but James Faulkner scoops the ball up and throws down the stumps. Cowdrey is just short but he's got his side back in this game. "James Tredwell has played the right options here and backed himself after some pretty terrible shots earlier on from his team-mates." Fabian Cowdrey and James Tredwell are really fighting for Kent and it's another expensive over with 11 coming from it. Cowdrey plays a cheeky reverse sweep for four off Kyle Jarvis' first ball and Tredwell follows it up by clipping another boundary off his legs. This pair have put on 50 in five overs. Great stuff. "This is superb stuff from these two. We expect they'll have to do plenty with the ball when Lancashire bat, but this is superb batting. "The crowd have really enjoyed that over while they bathe in the sunshine." James Faulkner is back into the attack, but he's greeted by James Tredwell cutting him away for four. The former England spinner then pulls him away for a maximum followed by a similar shot for another boundary. That was far too short from Faulkner. 16 from the over, and the crowd is suddenly in fine voice. "If Kent can get 140 then anything is just possible. They'll need to take wickets regular, but if they can tie Lancashire's batsmen down, you just never know." That's a better over for Kent as James Tredwell finds the boundary with a delicate cut shot. Seven runs come from it and Arron Lilley finishes a fine spell with figures of 2-21. James Tredwell and Fabian Cowdrey have settled things down after that flurry of wickets. However, Kyle Jarvis' over goes for just four runs and at this stage you have to feel it's not enough. Well we've just seen an over without a wicket...seems a long time since I've been able to say that! Fabian Cowdrey and James Tredwell are content to knock Steven Croft's 15th over around for a few singles. Five overs to go, can Kent get up to 140? "Kent are unravelling. What was Matt Coles doing there? "In a T20 match, seven overs is a long time. He had so many other choices of shot he could have played there. "In that given situation, it seems crazy to me." You have to say this is pretty brainless batting from Kent. Matt Coles, who has just come to the crease, tries to cream Stephen Parry over the leg-side but gets another top edge and Alex Davies takes the easiest of catches. Kent face a battle to see out their overs from here. "Parry has got reasonable figures with those two wickets now. If bowling first he goes for under 30 in his four overs, he would see that as successful." That could be game, set and match for Kent I'm afraid. Sam Billings tries to sweep Stephen Parry over mid-wicket but gets a huge top edge. Jos Buttler calls and takes the ball next to the bowler. Big, big wicket for Lancashire. Arron Lilley comes back well after being hit for six by Sam Billings, conceding just three more singles off the over. What a shot from Sam Billings! He gets down on one knee and smashes Arron Lilley high and handsome over mid-wicket for the first maximum of the innings. Kent need a few more of those! "As well as Lancashire have done here, Sam Billings is a dangerous customer." Finally Kent find a couple of boundaries. Firstly Fabian Cowdrey cuts Stephen Parry away before Sam Billings swats him over mid-wicket. 10 runs from the over. Much better for the hosts. Arron Lilley has 2-6 from two overs as well as that stunning catch under his belt. Kent are in all sorts of trouble, but Sam Billings is still there. We all know what he can do. "This is absolutely brilliant from Lancashire. They'd have given anything to have Kent five down at this stage. "Dangerman after dangerman has come and gone for Kent and they're in real trouble here." Oh dear, that's a pretty woeful shot from Alex Blake. The left-hander tries to pull Arron Lilley across the line but misses the ball and it thuds into his pad. It's pretty plumb and he's sent on his way. Kent are in danger of not seeing out their 20 overs here. Well the crowd are just getting their breath back after that stunning piece of fielding from Arron Lilley. Sam Billings will be the key to the hosts getting a decent score from here. He's 14 not out, but has all the shots in the book. "It's brilliant, absolutely brilliant out there in the deep! "A fabulous, fabulous effort. This is what we've come to expect from T20 cricket." That is absolutely spectacular fielding! Darren Stevens launches Stephen Parry to the mid-on boundary, Arron Lilley leaps up and spoons the ball back in with one hand and Karl Brown is there to take the catch. Simply sensational from Lilley and Kent are in big trouble. "It was an ugly looking shot there from Northeast. Got himself in an awful position and played the ball too late. "Think the ball from Lilley might have skipped on to him a bit quicker than he was expecting." The captain is gone and it's a bowling change which has worked. Sam Northeast tries to pull away Arron Lilley's first ball but is struck on the pad and up goes the finger. May have been a little high but he's got to go. Danni showing her allegiances there quite clearly! Stephen Parry is welcomed into the attack by Sam Billings who sweeps his first ball away to the square-leg boundary. However he comes back well keeping things tight. Both these batsmen are dangerous though. Finally Kent break the shackles with a couple of boundaries. Captain Sam Northeast cuts Tom Bailey away to the point boundary before pulling his final ball away for another four. They'll need a few more of those though. All of Kent's attacking intent has stopped for the moment as James Faulkner concedes just five runs from his second over. They've got a bit of rebuilding to do here. "Kent are going to have to regroup here and settle themselves down. "Not the dream start that they might have hoped for, but a long way to go in this game and T20 cricket can turn in the space of a couple of balls." Kent completely lost their heads in that over. If two wickets weren't enough, captain Sam Northeast is almost run out, but luckily the fielder can't hit the stumps. Two wickets in two balls for Kyle Jarvis and Lancashire! Joe Denly plays a wild swipe outside off-stump but the ball flies off the edge and Jos Buttler takes a fine diving catch to his right. "I wouldn't quite go as far to say Daniel Bell-Drummond's been put out of his misery there, but he played a number of false attacking shots during that innings and he only had one real successful shot. "He missed one on the outside edge and it was a real mix and match innings." The pressure of that last over has led to Daniel Bell-Drummond giving his wicket away. The opener tries to hit Kyle Jarvis inside-out over cover but miscues it completely and Karl Brown takes a fine catch. Australian paceman James Faulkner comes into the attack and shows all his international class by not giving the batsmen any width. Joe Denly tries to swat him away but can only miss the ball or find the fielder. Great over for Lancashire, just two from it. "Lots of bottom hand from Daniel Bell-Drummond, but he's got some real power and control when he hits straight down the ground." Daniel Bell-Drummond comes to the party now. He skips down the track and smashes Kyle Jarvis straight back over his head for his first boundary. Quite a tight over from Jarvis though, conceding just another couple of runs. "I'm just wondering if the groundsman has been getting up to prepare this wicket in the middle of the night during the women's Test as he can't have had too much time on it. "I'm looking forward to seeing what kind of surface he's produced for these two explosive sides." Joe Denly looks in the mood today. After a quiet start to the over, he pulls away Tom Bailey's fourth ball for four. Bailey comes back well, conceding a couple of singles, but nine still came from the over. A nice steady start for Kent. Steven Croft concedes a single and a two, before Joe Denly strikes a sweetly timed cut shot for a boundary. So we're just about ready to get under way at Canterbury. Lancashire's skipper Steven Croft to open the bowling, Kent's Daniel Bell-Drummond to face. As well as following our live text coverage of this afternoon's quarter-final, we also have a choice of listening for you. Click on the 'live coverage' tab above to select from a choice of commentaries from BBC Radio 5 live Sports Extra, BBC Radio Kent and BBC Radio Lancashire. Charles Dagnall, Henry Moeran and Ebony Rainford-Brent are on Sports Extra, Scott Read is joined by Graham Hardcastle on Radio Lancashire while Matt Cole and Peter Guise take up the microphones on Radio Kent. BBC Sport's Kalika Mehta at Canterbury: Sun, beer, morph suits, fireworks and #T20Blast cricket. Nothing better to do on a Saturday afternoon. "We haven't had too much time to look at the pitch with the women's Ashes Test on here this week, so it's hard to know what a good score will be. "We've just got to keep playing the way we have been really and play with as much freedom as possible." "There's fairly shortish boundaries compared to what we're used to at Old Trafford. There's been a bit of rain around during the week so hopefully it'll hold up in the outfield a bit. "Hopefully we can keep our good form in one-day cricket going and reach another finals day to extend our season for as long as possible." all ended in the gloom at New Road on Friday evening. Hampshire made it through to a sixth consecutive Finals Day, but courtesy of bad light and the Duckworth-Lewis Method. James Vince stole the show before the light faded with an unbeaten 107 in Hampshire's 196-4. The hosts were behind the clock on 58-2 in the ninth over when the game ended early after Chris Wood was hit on the nose misjudging a catch on the boundary. Birmingham Bears booked their Finals Day place alongside Northants. Laurie Evans struck a 31-ball 50 as the Bears reached 189-5 and then three catches from Rikki Clarke restricted Essex Eagles to just 165-7 in reply. Could they be the first side to successfully defend the T20 title later this month? it was David Willey who stole the show. Not content with taking 3-27 as Sussex set Northants 166 to win, Willey struck a 40-ball century to see the 2013 champions home by seven wickets and with four overs to spare. One Michael Yardy over went for 34 runs, while Willey's ton was the fastest in this year's competition. So first things first, let's bring you news from the toss at Canterbury, where Lancashire Lightning captain Steven Croft has won it and elected to bowl. Lancashire have England wicketkeeper Jos Buttler in the side along with Australian all-rounder James Faulkner. 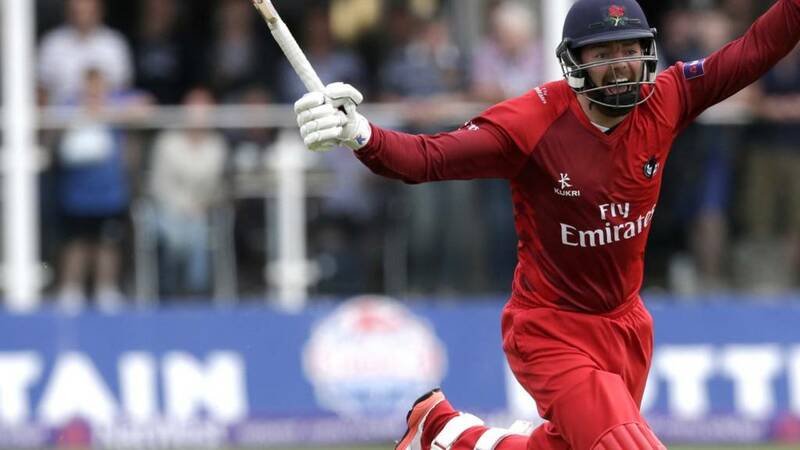 Kent are captained by the competition's third-highest run scorer, Sam Northeast, and have the big-hitting talents of England's Sam Billings and veteran Darren Stevens in the middle-order. We've already had a brilliant 40-ball century, the reigning T20 Blast champions comfortably making it through to Finals Day and a controversial finish at New Road. So what has our fourth and final quarter-final between Kent Spitfires and Lancashire Lightning got in store for us today? We're about 15 minutes away from the action so make yourself a cup of tea, put your feet up and let us take you through what promises to be another fascinating three hours of Twenty20 cricket.